I have been on the search for a cork/burlap/magnetic board to put above my desk for a while. It needed to be big enough to fill the space and I wasn't exactly sure what I wanted. Noel had gone to HomeGoods and saw a frame with a burlap board and mentioned it to me. I headed there to check it out. Era un po' di tempo che cercavo una specie di cornice da mettere sopra la mia scrivania. Doveva essere grande abastanza e poi non sapevo esatamente quello che volevo. La Noel era andata in un negozio dove aveva visto qual cosa che poteva andare bene. Ci sono andata per vederlo. They had a grey version of it so I snatched it up. Everything in my room is very smooth and the burlap would have been too much of a contrast. 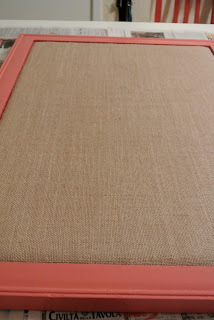 Plus, I knew I wanted the frame to be a coral color to stand out. I headed to JoAnn's to find some fabric to cover the burlap. C'era un girgio allora l'ho preso. Tutte le cose nella mia camera sono liscie allora volevo coprire la board con la stoffa. Volevo anche piturare la cornicie corallo perche' mi piaceva. Allora sono andata a cercare della stoffa. Finally, it was time to put it all together. Thanks to Noel, everything got done super fast! I love how it looks on the wall and it's perfect for what I need! Era ora di mettere tutto insieme. Grazie alla Noel, tutto e' stato fatto molto veloce! Mi piace molto come sta nella camera ed e' perfetto per quello che mi serve!